Wedding Reception | Outdoor Wedding Venues DFW | Paradise Cove | Grapevine Southlake Dallas Fort Worth Weddings, Events, Parties, Galas, Banquets and more. 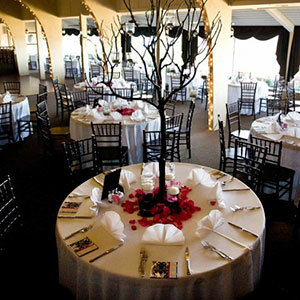 From the linens, selecting a menu and decorations, to the full bar set up and other personal touches, a Paradise Cove wedding coordinator will assist you to plan the details of the wedding reception with the full use of our facility including the dining area, patio, bar, bridal preparation room, dance floor, pavilion, gazebo and outdoor lakeside. Our venue offers an exceptionally beautiful setting and worry free coordination for our outdoor wedding venues in DFW. Whether you have a small, informal gathering in mind or a formal candlelight dinner with luminous centerpieces, Paradise Cove provides the ideal setting for the wedding and the reception you’ve been imagining. From the indoor dining area with our rustic fireplace and panoramic views from every window, to our breathtaking landscaping and gardens with majestic lake views, Paradise Cove creates a magical backdrop for an unforgettable ceremony and reception in our outdoor wedding venues in DFW. There is never a conflict between the scheduled events at Paradise Cove. When your wedding and reception is scheduled, the entire facility is yours, due to our practice of booking one scheduled event per day. That’s just one of the ways we show our dedication to you and your exclusive luxury wedding amid the natural beauty and immaculate gardens of Paradise Cove. Enjoy a delicious wedding reception dinner with friends and family. Our wedding receptions strive to provide impeccable catering and service. Furthermore, with a wide variety of delicious menu options to select from, you are certain to find a crowd pleasing menu. Our menus provide exquisite culinary skill and thoughtful sourcing of the freshest ingredients available. In addition, we will provide options for guests with special dietary needs when you let us know of the need. Our goal is to provide delicious food, and exceptional service, so that both you and your guests feel pampered. Your special day will be orchestrated with expertise and ease, while providing guests with splendid views of the lake and delicious cuisine sure to delight and satisfy, as they toast your new life together amid the stunning setting of Paradise Cove’s outdoor wedding venues in DFW. There are a number of ways to create a unique experience for you and your guests. Our staff will be glad to work with you to create ideas that will reflect your personality throughout the event. Paradise Cove’s outdoor wedding venues in DFW provides more than a beautiful setting for this milestone in your life. We’re dedicated to ensuring your wedding is the first of all the wonderful memories to come. Our wedding coordinator will assist you through the planning and will handle the details, allowing you to concentrate on being beautiful (and handsome) for the first day of the rest of your life. Contact us for additional information and a personal tour, to book your wedding and wedding reception or for any questions you may have. We will show you our venue and discuss our various options with you.